We finally get to see the Eligius prisoners and they’re quite the vicious group. What I mean by vicious; they’re not going to share Eden, and will (probably) destroy anyone who tries to question them or steps foot. Yet, as we all know, Clarke will fight for their rightful paradise, and with Madi in tow (whom by the way, Lola Flanery made her debut in the trailer), she will have the most damning reason to. This is 100% all Clarke-protecting those she loves, and sacrificing herself in the process. On the bright side (if there is ever a ‘bright side’ on The 100) Charmaine Diyoza (Ivana Milicevic) enters in with cold, calculating confidence and possessive attitude that emulates her as the “perfect villain” and I am just as excited as much as terrified to learn her backstory. How and why did Charmaine become the “monster” that she is, and why are the prisoners so eager to follow her orders, her rules. The 100 is known for its multi-faceted ‘bad guys’, from Cage Wallace, to ALIE, and to Pike, and it seems like Charmaine will be added to that group without issue. We also got glimpses of the other Eligius kru-Zeke Shaw (Jordan Bolger) and Paxton ‘Graveyard’ McCreary (William Miller) who will only add elevation to the season five storyline and suspense true to The 100 form. What else that these intriguing characters will bring to the fire, we will just have to see. Meanwhile, Bellamy and his crew are prepping to land back on the burnt earth, but he is questioning the prisoner ship as they spot it. Just stay the hell away from them Space kru! They’re evil! In the bunker, Octavia is using violence for peacekeeping, and it is the bloody battle–something that her brother will not approve of. At Unity Days earlier this year, Marie Avgeropoulos says that he will have a hard time swallowing the woman Octavia has become, and fans may not like her character. Octavia is also seeking advice from Jaha, the last person that I believe that she will go to because after all, he was the one who jailed her for “being born.” Additionally, Bellamy and his sister get into a war of their own–and whether or not that this will be the end for either one is a burning question and something very fearful. But sometimes, it takes the strongest love to distinguish the demons. And whether Octavia’s fighting because it is a result of her anger and revenge from being locked up and secluded, or she is really trying to save the human race, we will get that answer when the time arrives. When Octavia emerges from the bunker with Wonkru warriors, she will make it her duty to fight for the land. Who helped them out the bunker though? Was it Clarke? Or Bellamy? Or maybe even Monty. The partnership that I am looking forward to in season five will be Clarke, Octavia, and Madi working together to keep the ‘bad guys’ out. Clarke and Octavia had little screen time together, and this exciting new concept will only thicken the plot. There are also people fighting in what appears to be an MMA cage ring inside the bunker and why they’re fighting, I have not a clue. Perhaps it is for training purposes or they have a duel where the loser dies and the winner keeps his life. Yeesh, I did not think to survive on post-apocalyptic earth things will be that desperate. But then again, I am not in that morbid situation, so who the hell am I to judge? Whatever you have to do to save yourself, regardless of belief, or the unfathomable, you’ll do it. Our minds are just naturally programmed to survive because it has that hope. On another level, Kane does not like it. Other interesting tidbits from the trailer include an embracing Kane and Abby as they question their doings of whether this is the right way to save their people-to survive. It is very nostalgic of season two, and they were both underground when they question it then-just like now. That makes a unique and connecting parallel to the narrative and that is what keeps the story going. Murphy also said “What the hell. Let’s be good guys,” which is a striking irony to his character development over six years, and adds to the Abby/Kane parallel. But aside from the survival violence and evil, there are softer moments in the trailer. Near the end, everyone-well, nearly everyone-are hugging and crying, and having all kinds of reunions. We know that some of these relationships will break apart-and there will be some new ones to keep the perspective interesting. It is one of the more lighter sides of The 100, because at the end, your family is worth the fight, worth the life, and perhaps, that is salvation the characters are seeking for. Monty said, “If war is the only way to have the last surviving land on earth, then maybe we don’t deserve it.” However, if that land has all of your loved ones and everything that you hold dear, then perhaps war is the answer. Nobody likes war more than I do, but if all other options fail, then it might be worth it. Again, I am not in their situation, so I really cannot properly answer that. There will be more Gaia and Indra moments, in which I am quite thrilled about. I find their mother/daughter relationship complexing, but Indra seems to be supportive of her and gives her advice and consultation of what war is about. I am sure that there are plenty of tiny fragments that I may have missed, but once the show starts up again April 24th (set your DVRs), the gaps will be filled and theories and analogies will be answered. And, all of this will come into full light. I like how the Bellarke reunion was not mentioned or shown in the trailer. This is one where I think needs to be a surprise, where the full-on emotion and overall feeling can be truly felt. Is Murphy being left behind on the Ring? I hope not! We need more Echo. Yeah, definitely need more Echo. How did Charmaine receive that gruesome neck scar? Are Jackson and Miller a “thing”? Did cannibalism really happen in the bunker? Is this a revival of the Donner party? Eww. Why is Octavia speaking with Jaha–the dude of whom she is not particularly fond of? Is Octavia wearing Lexa’s red velvet cape?! If so, Lexa truly lives on. What the hell is going on inside that belly? Algae oatmeal is nutritious, but not delicious. What happened to the power in the Ring? Why is nothing lit up? Why are Bellamy and Murphy fighting one another? For power? For training? Because one of them screwed up? WHY? How will Madi fit into the storyline? Why is Charmaine not a sharing person? Is it just me, or does space Kru seem to be the most diplomatic of the groups? 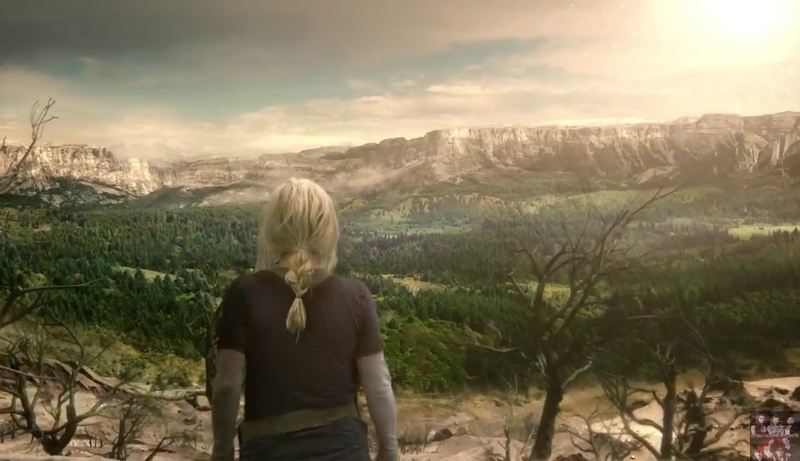 So, what did you think of The 100 season 5 trailer? Let us know!